Blowfly strike (or simply strike) is the popular name for cutaneous myiases caused by several Dipteran flies of the family Calliphoridae. Cutaneous myiasis are skin infections with fly maggots that feed on the superficial tissues of their victims. They are particularly abundant and damaging for the sheep industry in many regions of the world with temperate climate, e.g. in Australia, New Zealand, Great Britain, Ireland and South Africa. Prevalence and incidence depend strongly on climatic and ecologic conditions. In the UK it is estimated that 80% of the sheep farms are affected each year. As a general rule sheep blowflies prefer moderate and warm climates. In most endemic regions blowfly strike is a summer pest with peaks during the hottest months. Rainy weather strongly favors blowfly strike. 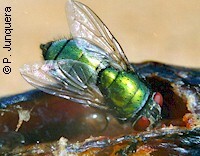 Lucilia cuprina, the Australian sheep blowfly. Occurs mainly in Australia and South Africa, but also in other parts of the world, e.g. in North America. Lucilia sericata, the common green bottle fly, the sheep blow fly. Occurs mainly in Europe and New Zealand. Other less frequent species are Lucilia caesar, Protophormia terranovae and Phormia regina. Sheep and also goats are usually the primary victims but other domestic and wild animals are occasionally affected as well. All these flies are facultative parasites, i.e. they can survive on carrion, corpses, dung and other substrates. They lay also eggs on wounds and injuries of various animals. But Lucilia cuprina and Lucilia sericata are also primary myiases, i.e. they also deposit eggs on uninjured sheep. Adult sheep blowflies are medium-sized (7 to 12 mm long) and with blue or green metallic colors. Adult flies feed on plant fluids rich on sugars but also on animal body fluids. The females are attracted by putrid odors such as those produced by carrion, but also by urine and excrements that contaminate sheep wool in the breech (buttocks), or by fleece rot and lumpy wool. Foot rot is also attractive to egg laying flies. Each adult female deposits up to a total of 3000 eggs on the wool of attractive sheep in successive batches. Young larvae hatch about 12 hours later and crawl down the fleece to the skin surface. They scratch the skin with their mouthparts and feed on skin debris and exudates. The initially small injury becomes quickly larger and deeper, and attracts more pregnant flies. Larvae mature in 2 to 7 days, drop down and burrow themselves in the soil for pupation. Adult flies emerge about 2 weeks later. Depending on weather conditions 2 to 8 generations can follow within one season. Hot and humid weather strongly supports egg laying activity, whereas windy weather reduces it. Blowflies are excellent flyers: they can fly up to 10 miles searching for food. Breech strike, that affects the rear quarters, due mainly to excess skin wrinkles and dags, i.e. dried feces dangling from the wool. Body strike, that affects the flanks and the back, due mainly to fleece rot and/or lumpy wool. Other types are poll or head strike that affects mainly horned rams, and pizzle strike that affects the prepuce of wethers or rams. Blowfly strike is a serious pest for sheep. Ewes and lambs are especially affected. The maggots virtually eat their host alive, which is highly stressing and annoying for the animals. Secondary bacteria infect the wounds and the hosts' organism. The maggots produce also ammonia, which is poisonous for sheep. As a consequence affected sheep are depressed, stop feeding, suffer from fever, inflammations, blood loss, etc. Left untreated blowfly strike is often fatal for affected sheep, especially for lambs. Economic impact can be enormous for the sheep industry: it has been recently estimated to be in excess of $250 million only for Australia. A substantial key to prevent blowfly strike is to diminish sheep attractiveness to blowflies. How this can be achieved varies according to sheep breeds, climatic and ecological conditions, management practices, etc. The most adequate measures for a particular property have to be determined on a case-by-case basis. Shearing reduces flystrike incidence because it suppresses the humid microclimate in the fleece that favors maggot development. Fly females will deposit fewer eggs on dryer wool and many larvae will not survive the dry environment. However, where wool production is important shearing must often be scheduled on other criteria than flystrike prevention. Crutching, i.e. removing wool between the rear legs and around the tail, reduces the amount of wool soiled with urine and feces, which makes it less attractive for flies. Shearing and crutching are most effective if performed just before the periods with the higher flystrike risk. Whatever reduces fleecerot and lumpy wool will significantly diminish flystrike incidence, e.g. maintaining the wool as dry as possible through exposure to sun and wind. Tail docking and mulesing (removal of strips of wool-bearing skin from around the buttocks) are known to strongly prevent breech flystrike, because they diminish the amount of fleece soiled with urine and excrements that attracts egg-laying flies. However, these practices are strongly controversial for understandable animal welfare reasons and significant research is being carried out on less cruel alternatives. Keeping the flocks free of gastrointestinal worms will diminish the incidence of flystrike. The reason is that such worm infections often cause diarrhea (scouring) that makes the breech wool highly attractive for pregnant blowflies. It is known that within the same flock, some sheep are less susceptible to become infected than others. A long-term preventative measure consists in selecting those animals for breeding that are less susceptible to flystrike, e.g. those with less wrinkles and a lower degree of wool cover in the breech, those that are less susceptible to develop fleece rot and lumpy wool, etc. A lot of research has been carried out on vaccines against blowflies. Unfortunately it seems that it will take many years, if not decades until a commercial blowfly vaccine reaches the market. Research on traps for catching blowflies has shown that they do not significantly reduce flystrike incidence. However they can be useful to monitor the blowfly population, which is very useful to determine the best moment for preventative treatments. So far there are no effective repellents to keep blowflies away from sheep or other livestock. There are so far no true biological control methods effective against blowflies. Learn more about biological control of flies and other insects. In most countries, chemical control of blowfly strike is preventative, rather than curative, i.e. it aims at preventing fly eggs from further development to parasitic maggots, and not to kill already established myiases. This can be achieved with active ingredients that kill the young fly larvae (so-called larvicides), or that interrupt their development (so-called insect development inhibitors). A key feature of all these products is the length of protection they provide. Some products will protect sheep for only a few weeks (e.g. 3-4) and can be adequate for protection sheep shortly before slaughtering. Other products prevent flystrike for several months (4 to 5). Which product is best suited depends also on withholding periods for beef (and milk on dairy sheep and goats) but also for shearing, as well as export slaughter intervals in those countries where they apply. Most flystrike preventatives are for external use and are available as concentrates for dipping (e.g. plunge, cage or shower dipping) and/or spraying (e.g. power spraying, jetting, etc.) that have to be diluted before administration, or as ready-to use formulations (pour-ons, spray-ons, etc.). All are designed to impregnate the wool and to prevent maggot development. Organophosphates (e.g. diazinon, chlorfenvinphos). Veteran pesticides with larvicidal effect, control also lice, mites, ticks and other external parasites of sheep. Vastly used in the past, nowadays being phased out in several countries due to human health risks. Where blowfly resistance to organophosphates is widespread (e.g. in Australia) efficacy can be reduced to a few weeks. Otherwise up to 12 weeks protection against susceptible blowflies. Vastly used in agriculture as well. Synthetic pyrethroids (e.g. cypermethrin, deltamethrin). Veteran pesticides with larvicidal effect, control also lice, mites, ticks and other external parasites of sheep. As a thumb rule, synthetic pyrethroids provide only a few weeks protection against flystrike. Vastly used in agriculture as well. Macrocyclic lactones (mainly ivermectin). Effective also against lice. Provide up to 12 weeks protection. Unlike many other macrocyclic lactone formulations, those approved for topical use on sheep against flystrike are ineffective against gastrointestinal worms. Several macrocyclic lactones are also vastly used in agriculture as well. Spinosyns (mainly spinosad). New generation pesticides. Effective also against lice. Provide 4 to 6 weeks protection, but with nil withholding period for meat, wool or export. Vastly used in agriculture as well. Insect development inhibitors (=IDI). Do not kill the maggots quickly, but interrupt their development. Cyromazine, a veteran IDI now used for more than 30 years has not developed resistance so far. Provides up to 12 weeks protection. Used in agriculture as well. Diflubenzuron and triflumuron belong to the benzoylureas, and are veteran IDI's vastly used in agriculture as well. Effective also against lice. However, blowfly and lice resistance to these chemicals is widespread in several countries (e.g. Australia and New Zealand). To cure already established infections some preventative products will quickly kill the maggots in infected wounds as well, especially those with organophosphates and macrocyclic lactones. Otherwise there are numerous dressings for this purpose. They are available in numerous ready-to-use formulations such as powders, lotions, ointments, creams, sprays, aerosols, etc. They contain mainly larvicides belonging to the synthetic pyrethroids (e.g. cypermethrin, deltamethrin, permethrin), carbamates (e.g. carbaryl, propoxur) and organophosphates (e.g. chlorpyrifos, diazinon, trichlorfon, etc.). These dressings often contain disinfectants, painkillers, and/or wound healing chemicals as well. Such dressings for livestock are sometimes approved for use on dogs and cats as well. If available, follow more specific national or regional recommendations or regulations for flystrike prevention and control. Blowflies developed resistance to old organochlorine pesticides already in the 1960's. Resistance to organophosphates developed later and became widespread already in the 1980's. Nowadays, resistance of Lucilia cuprina and Lucilia sericata, against all organophosphates and benzoylureas is high and widespread in several countries (e.g. Australia and New Zealand) and numerous products that were quite successful in the past had to be withdrawn because they have become almost useless. In 2012 a field strain of Lucilia cuprina blowflies resistant to cyromazine has been reported in Australia. It is the first case reported more than 30 years after the introduction of this compound. The strain shows a low resistance factor of 3 and cross resistance with dicyclanil. In regions where these products are still available, if a particular product containing such active ingredients has not achieved the expected control, the reason can be resistance, especially if application mistakes can be excluded. So far there are no reports on field resistance of blowflies to dicyclanil, ivermectin, spinosad or synthetic pyrethroids.